Oolong tea from Taiwan. Formosa, meaning ‘beautiful’ was what the Portuguese explorers called this island. 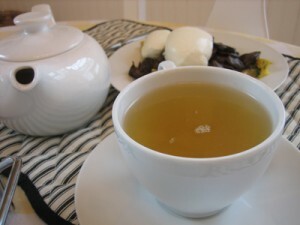 The oolong tea grown here continues to be called as such. 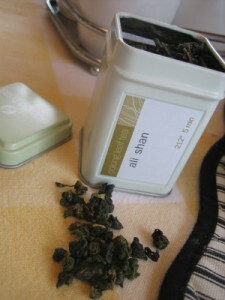 The exquisite bouquet of Formosa Oolong tea is regarded to be the finest in the world. Complex floral notes echo on your palate as you enjoy this product of Taiwan’s Ali mountain. 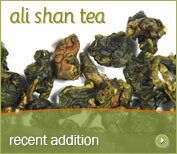 Light bodied and softly sweet with an underlying complexity, this oolong will surely come to haunt. Perfect for multiple infusions. Who could resist such a description? Besides, I’d just finished a day-long horseback ride through winding hills the previous day. Today’s grey morning seemed to call for a pick-me-up tea that would extend my I’m-on-vacation-experiencing-new-things feeling, so I decided to finally try this. Adagio’s preparation directions for this tea recommend steeping in water that’s been brought to 212 degrees (a full rolling boil) for five minutes. 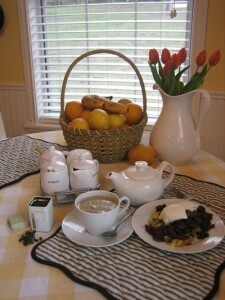 I used two teaspoons for my 2.5 cup teapot and followed the recommendations. Actually, I may have over-steeped it a bit since I was distracted for a moment, but apparently this tea can take it. The result was a cup with a glowing golden color, a medium-bodied feel and smooth taste despite the long steep time. I detected no real bitterness, though there was something that was either smokey or woodsy to me; maybe “earthy” is the way to describe it. Either way, it was a very subtle note. In fact, it reminded me a lot of a green tea. Now that I think about it, this is the second time that I’ve described an oolong tea as reminding me of a green tea. I’m going to have to figure out why that is. This was an altogether lovely tea, and I can’t wait to try a second steeping to see how it fares.